12 volt inverter runs�32-40 feet of EL Wire. Constant on Constant & Flash Inverter runs�32-40 feet of EL Wire. 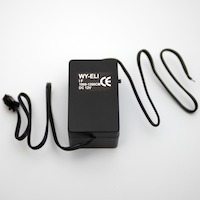 Attach to your 12 volt power supply. 12 volt inverter runs 32-40feet of EL Wire. Please not you wil have to order a male lead wire part to atach the El wire.